It’s been a little while since we’ve had a general update on Apedale progress, so here goes. Tracklaying has resumed again; those who visited our September open days will have seen trains operating on what is known as the Red Shed Bypass line; the main passenger running line will run parallel to the Bypass line, then alongside the large Aurora North storage shed, and then beside the site access road until the Stage One terminus at Apedale Road is reached. Later stages will see the railway cross Apedale Road and head into the Country Park, but that’s in the future. Laying the passenger running line has been delayed by obtaining the necessary consents to divert a slightly inconvenient footpath. Whilst this churns through the corridors of power, we have commenced work on the railway alongside the access road. The need to preserve the current footpath means that the new section of railway is not connected by rail to the existing system, which makes construction rather challenging logistically. 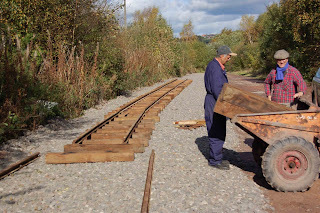 Thus far, two approaches have been tried – firstly to build the track into panels elsewhere on site, and then transport by crane to site and lay into position. This can be seen in this week’s first photo. The alternative approach is to build the track in situ, bringing all the required parts to site using the dumper truck. It’s fair to say the jury is out on the best method. The second photo shows the MRT “A” Team contemplating said dumper truck. If you fancy coming along and telling us where we’re going wrong, then we’re on site every Saturday – contact us here. You can come along and just have a look around on November 9th, when we mark the 90 anniversary of the end of WW1. And if you come on that day, offering opinions on the best way to build track is not mandatory.